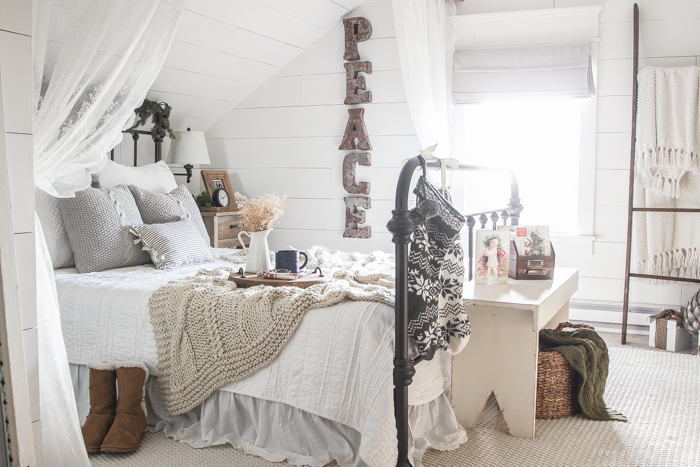 This post is sponsored by our friends at Birch Lane // Hi, loves. Yes, you read that title right. Even though it is only the day after Halloween, and I still have pumpkins sitting on my front porch, we are going to start November with some decorating for the holidays! Now before you think I’m totally crazy for busting out a Christmas tree this early, hear me out. I have a TON of ideas for what I want to do with our little farmhouse for the holidays, and I want to have them all up on the blog before it’s time for you to start YOUR holiday decorating. That means I have to start a little early this year! 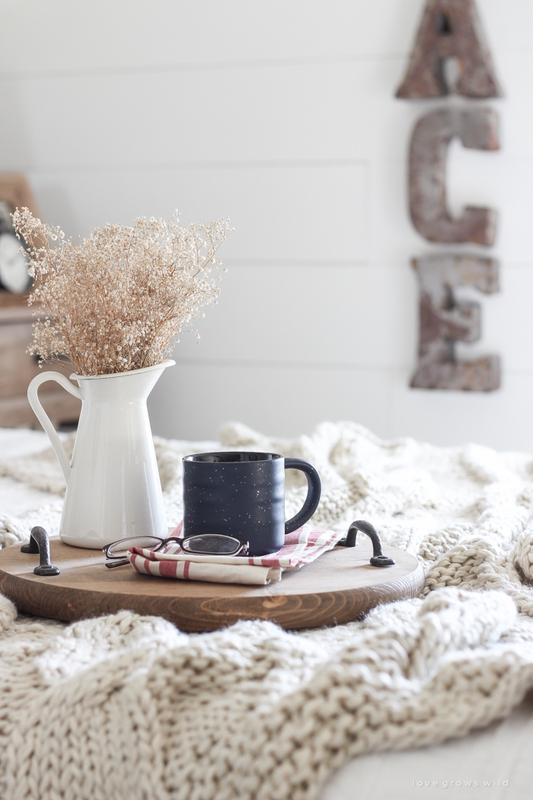 This fall, I had the great privilege of joining some fellow bloggers in a series we like to call our “Farmhouse Holiday Series”, and starting today we are continuing on and shifting our focus from fall to winter. 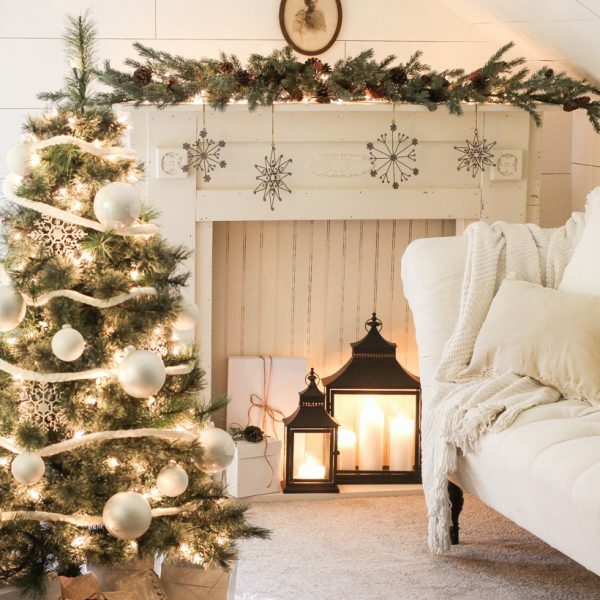 Our goal is to share easy ideas for simplifying the hustle and bustle of the holidays and creating a cozy, inviting home that is the perfect backdrop to create beautiful holiday memories with your loved ones. I truly hope that you enjoy this decorating series as much as I do and get some great ideas for your home! – all sources are listed at the bottom of this post! 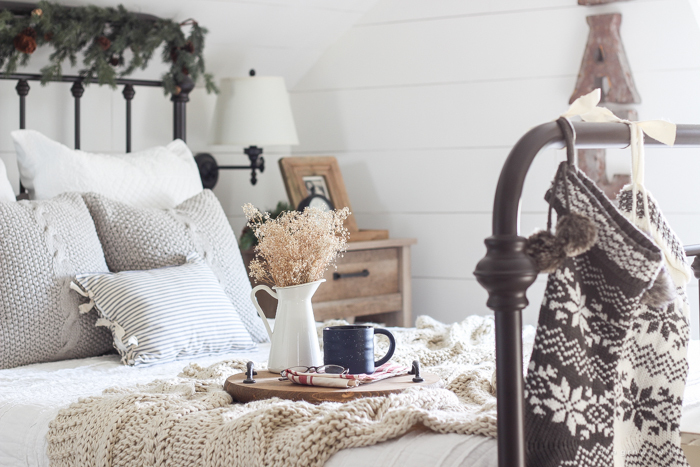 Since it is still a little early, I wanted to ease slowly into our holiday decorating, and the master bedroom seemed like a great place to start. 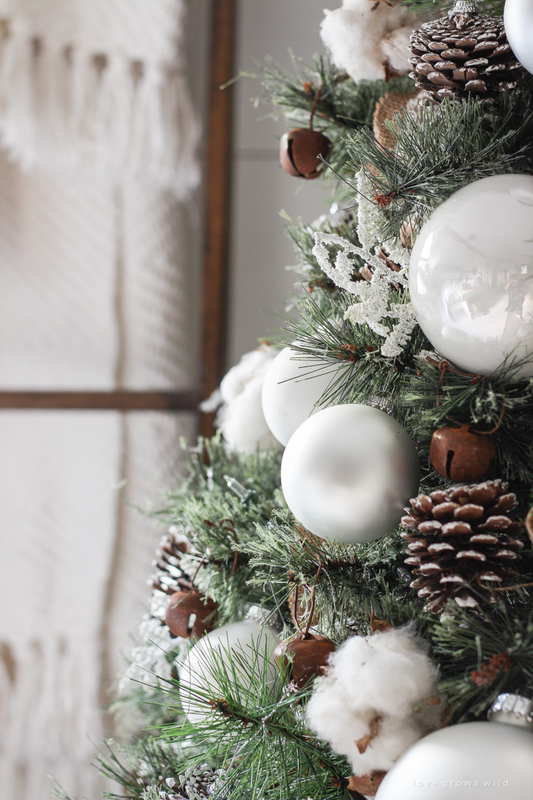 You won’t find a lot of bright reds and greens in my holiday decor, but you will find plenty of soft layers, cozy neutrals, and Christmas spirit sprinkled throughout the house. 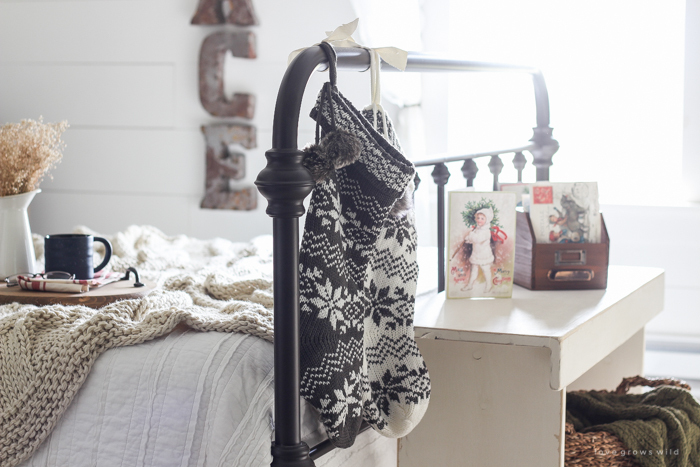 I laid out a super soft, chunky throw blanket on our bed for those chilly nights and hung two knit stockings at the foot of our bed. Last year I used a wreath at the head of our bed, but this year I added an evergreen garland to the bed frame using floral wire to secure the branches. See those gray pillows on the bed? I love anything knit this time of year! One of the big focal points of the room (other than the tree that I’ll get to in a minute!) is the word “peace” spelled out in rusty metal letters. 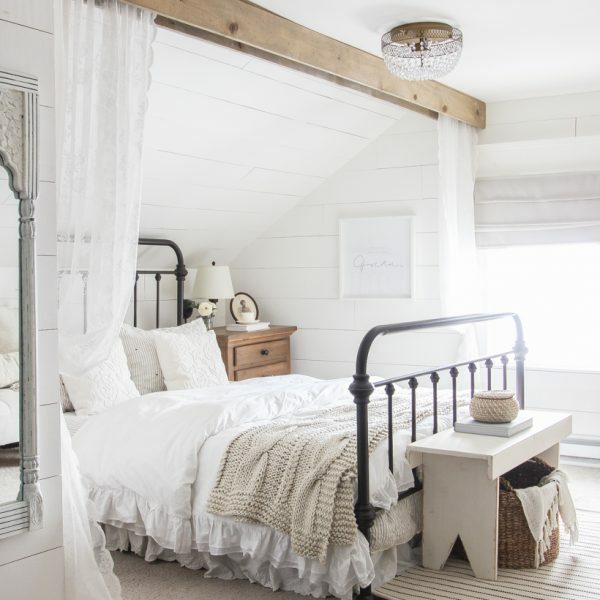 I love their beat-up, rustic character, and against the planked walls in our bedroom, they really pop. 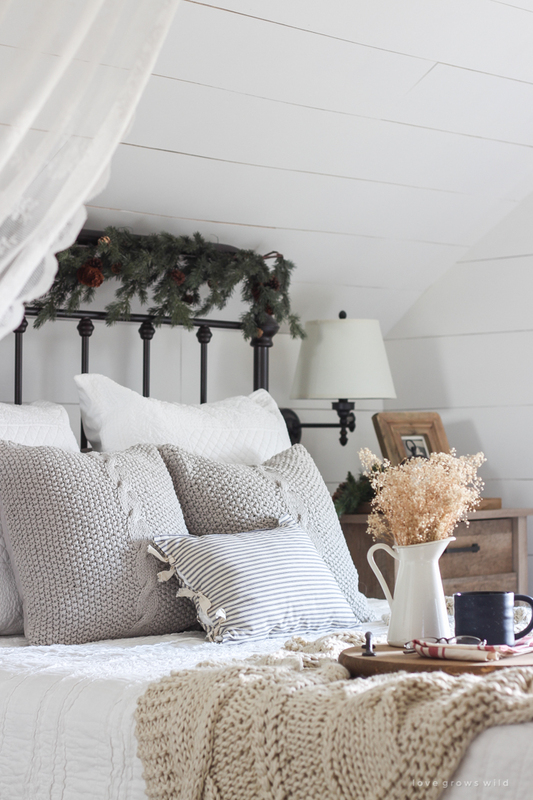 Across from the bed nestled in a little corner sits the other focal point of the room… a cute, little Christmas tree decorated with large white ornaments and snow-covered pinecones and rusty, old bells and lace and burlap ribbon weaving between the branches. Looking at this little tree all lit up in the evenings while I’m in bed makes me so happy. I would probably leave it up all year long if you guys wouldn’t think I was totally crazy! I really wanted to show you guys two different types of trees this year. This tree is absolutely dripping with ornaments from every branch for a really full, layered effect. 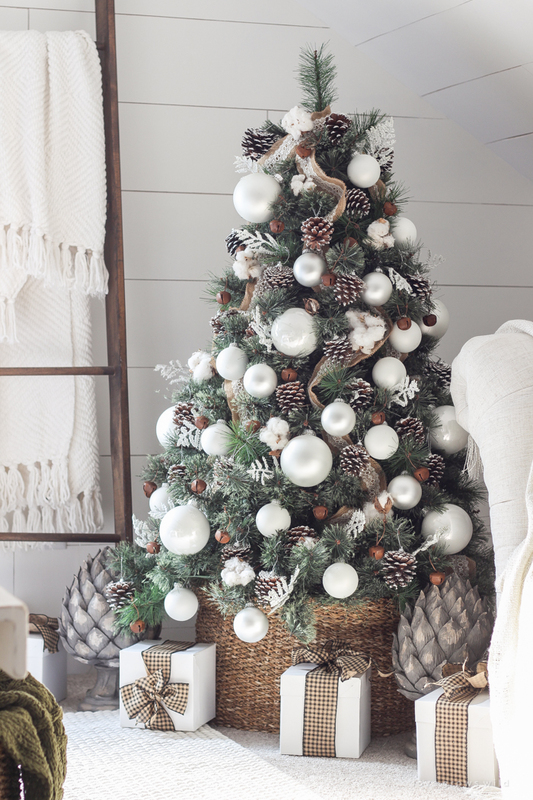 I started by weaving burlap ribbon down the tree from top to bottom and then started adding the large white balls. 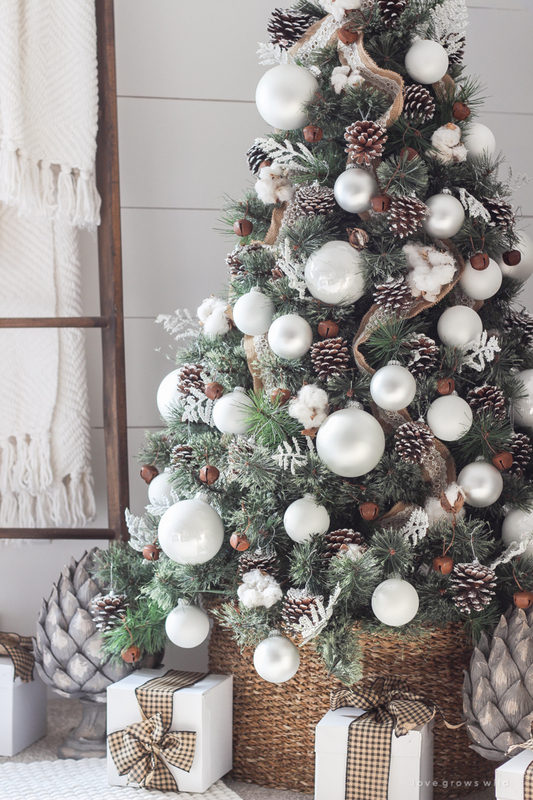 Having such large ornaments on a smaller tree really makes a big impact! Then I placed pinecones all throughout the tree, which added some texture and an element of nature, which I love. 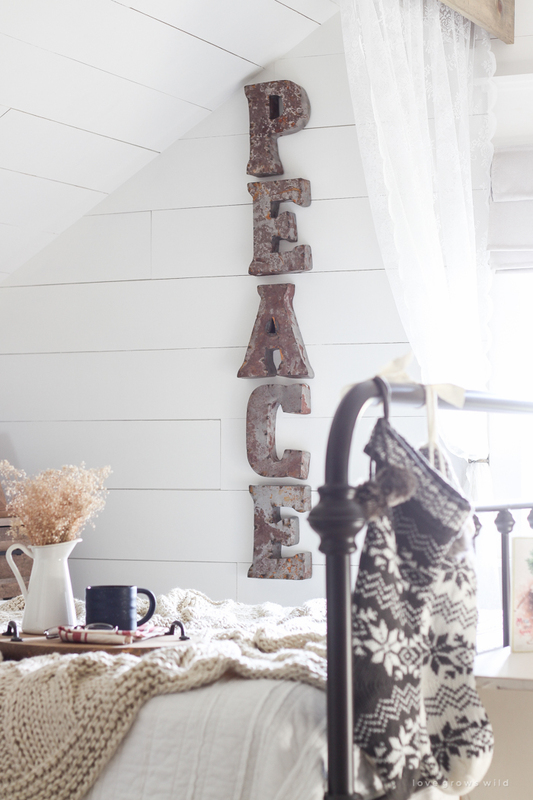 The rusty metal bells tie into the letters on the wall, and little pieces of cotton wood add some softness to the tree. I was going for a really full look with this tree and didn’t want to see many of the branches sticking out once I was finished. I think for our big tree in the living room I’m going to do a more minimalist look to show you a different option for decorating your tree, but I absolutely love the way this little cutie turned out! 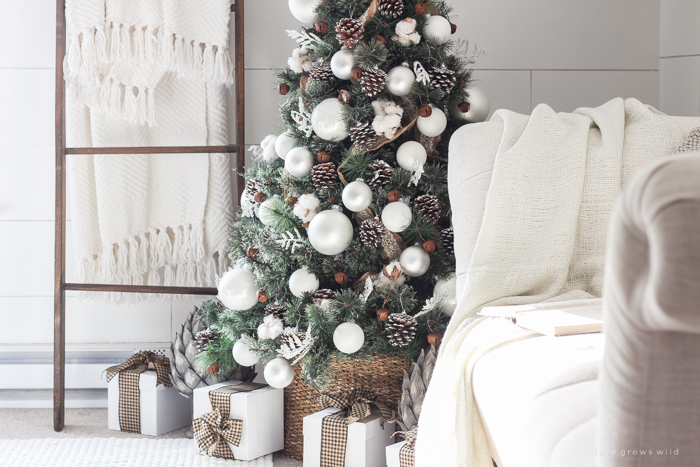 The neutral colors, the textures, the sweet, little presents wrapped underneath… swoon. I think what I love most about this room is that it feels like a total winter wonderland retreat, but I didn’t have to change a lot or put a ton of work into this holiday decorating. 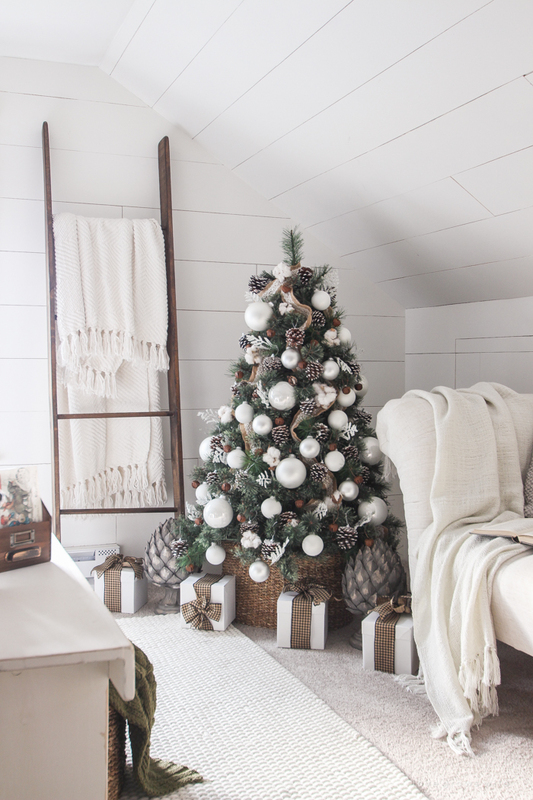 A tree went up, some cozy blankets were added, and a few little details like Christmas cards and stockings and wrapped presents under the tree gave this room a completely different feeling. Simple, minimal, cheerful, and bright! round wood tray –tutorial in my book! stripe tied pillows – tutorial in my book! 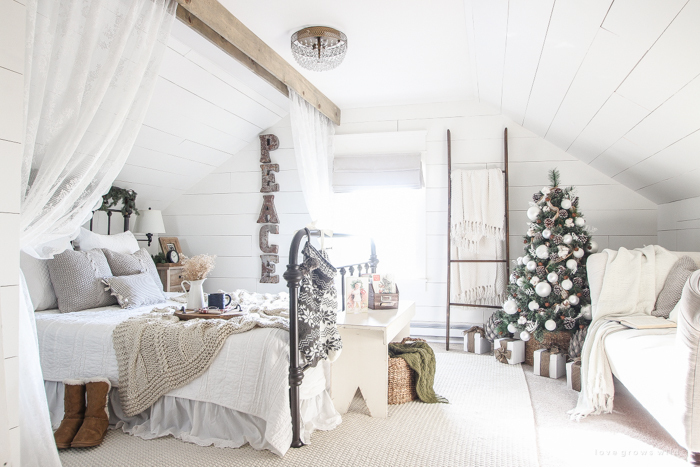 Oh how I would love to spend a night in that bed with the Christmas tree lit up and it snowing lightly outside. Pure peace. Very pretty! And that Christmas tree is gorgeous! I’ve been known to consider leaving my tree up too, so you’re not by yourself there. And I usually do leave my little Christmas villages up till spring! I enjoy looking at them. 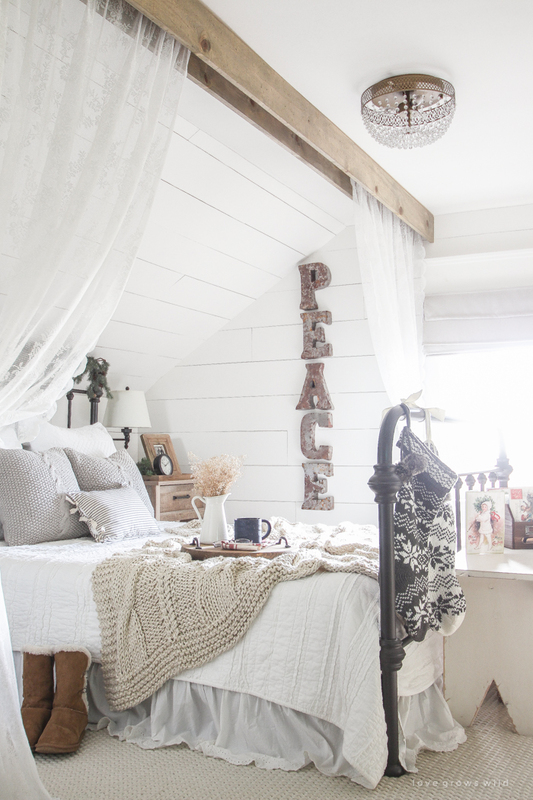 Love the neutral palette. So cozy with the chunky throw and pillows. Tree looks perfect in that basket! Simply beautiful. Soooo charming, and colors you can live with for a long wintertime! Thanks for sharing how you did your tree! I love it! 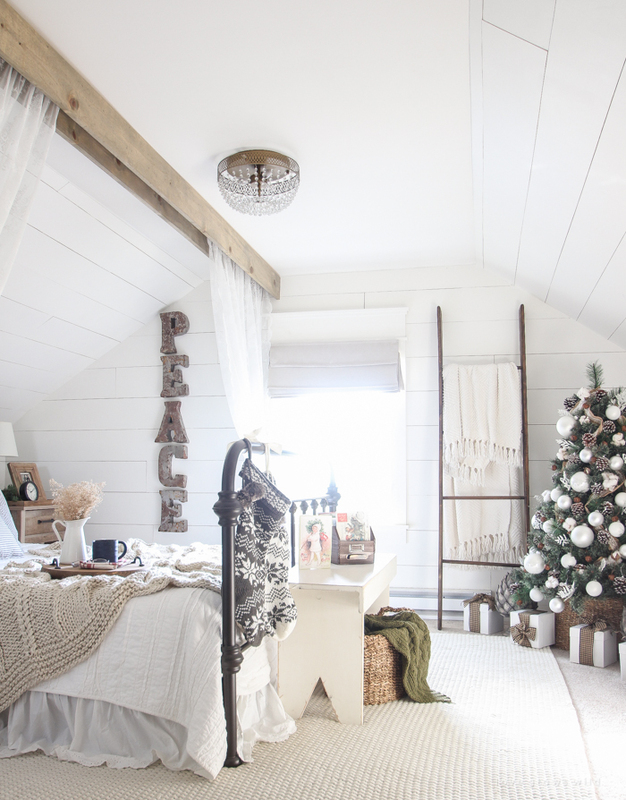 Beautiful Christmas bedroom! I just wanted to climb into the picture! Happy November! What a gorgeous space Liz!! 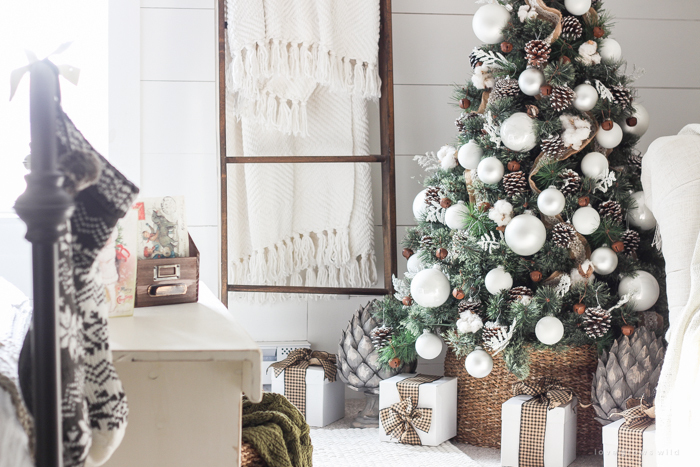 I love the tree, and every cozy accent, perfect! Love your tree. Where did you get the rust bells. I would love to get those and how large are they? Happy Holidays. I’ve never really thought about putting a tree in the bedroom before, I don’t think we even have the space. 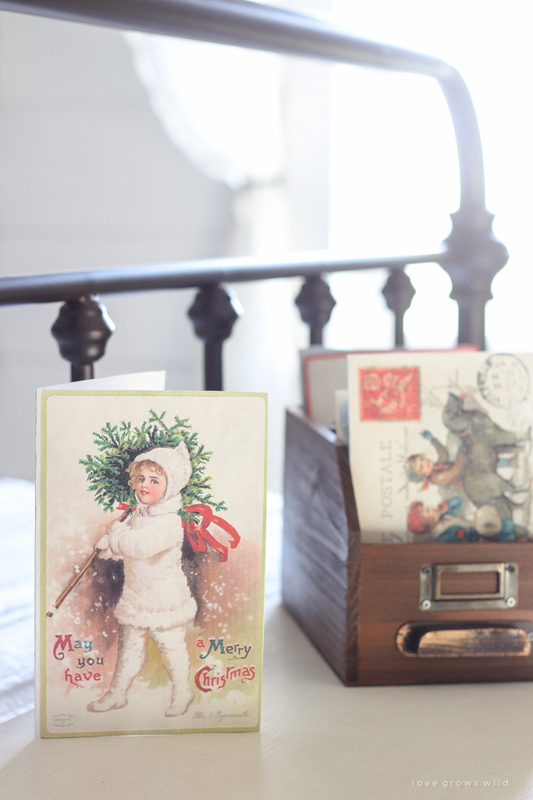 Our bedroom decorations are going to be pretty much based on the images in this post http://www.sharps.co.uk/5-style-updates-to-get-your-guest-bedroom-ready-for-christmas. We have a Scandi style design already so I think the decor here will really complement our existing style. 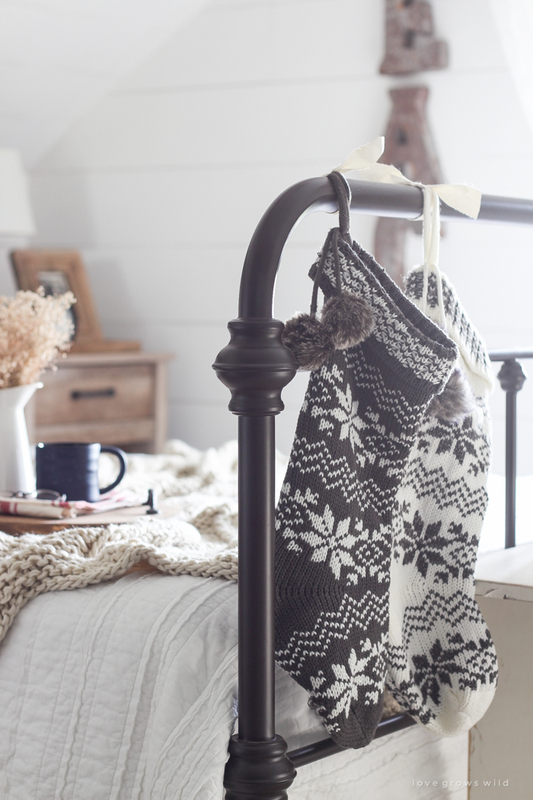 Those stockings hanging from the bed are going to be an essential addition they look awesome!